As far as L.A. drives go, cruising on the 134 through the center of Glendale is pretty fun. But on the ground, it’s not so nice: the freeway slices right through the heart of the city like a giant clogged artery. 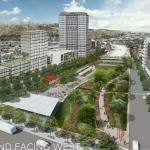 There’s a plan afoot to add some much-needed green space to a stretch of the sunken freeway, which would help knit together Glendale and reduce the toxic effects of motor emissions. Space 134, as it’s called, would encompass 24 acres of land near Glendale’s downtown. 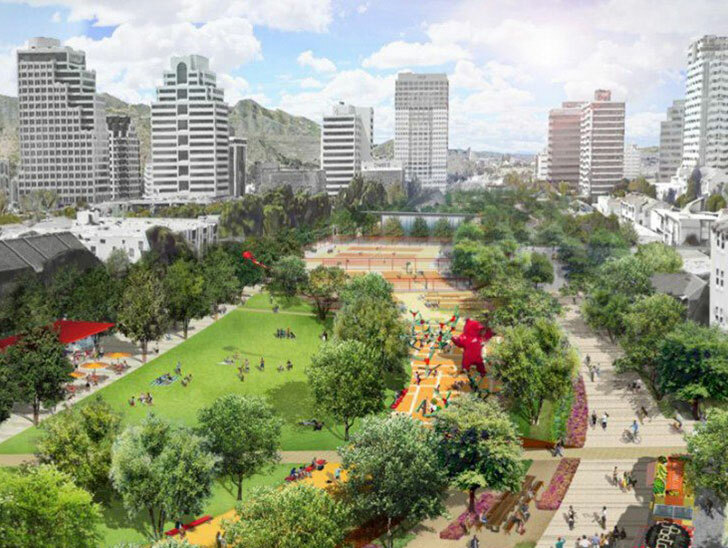 Plans for the park, shared on a website from Glendale’s Urban Development Department (via Urbanize LA), feature numerous amenities—a community garden, kids’ play area, farmer’s market, coffee kiosk, restaurant, sculptures, a great lawn, and more. A planned mobility hub would centralize buses, cabs, and shared vehicles and could include a new light rail or busway station. Metro’s seven-year-old long range transportation plan actually mentions an unfunded proposal for light rail to Glendale. 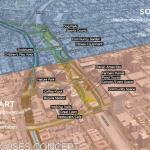 With or without a train or bus station, the park would likely be built in two phases, with the first encompassing the freeway from Central to Brand avenues, while the second phase would cover Brand to Balboa. Although landscape architect Melendrez has already been commissioned to draw up the early plans—which followed neighborhood input—the park is a ways off. If the $150 million needed for construction, which seems like a conservative estimate, is dug up, construction wouldn’t start until at least 2020. Though plans like this seem too wonderful to be true (see: Hollywood), they have come to fruition before in southern California. Who Owns The Land Under L.A. Freeway Overpasses?